Happy Finals Week from 13th Floor! Happy finals week from 13th Floor Magazine! We hope all of your exams, papers, and projects are going well so you can get outside to enjoy the beautiful weather. This year has gone surprisingly fast; Issue 1 was released ten months ago, but it feels like only mere weeks have passed. 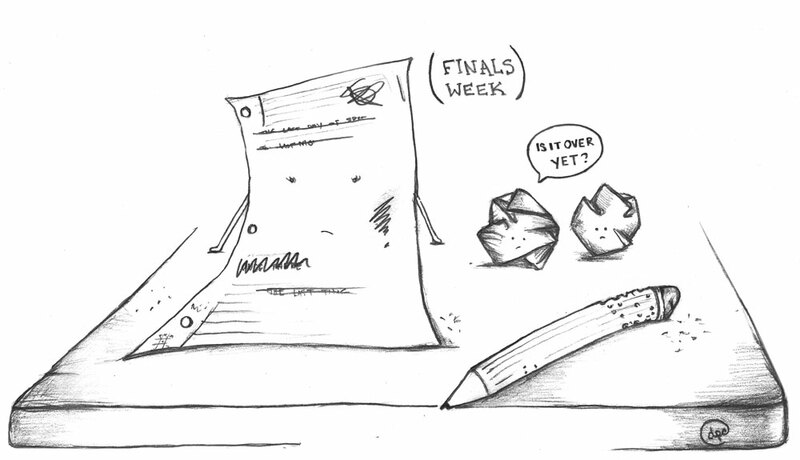 Having time fly by so quickly can allow finals week to rear its unwanted head sooner than expected. Some of you have gone through this routine for the last eight or so semester while other have only made it through one. Either way, it is always a smart idea to refocus your energy and study habits when it comes to finals. An article from Florida International University, published in December 2013, has eight great tips for helping you prepare for your finals. This useful list covers the effects of study locations, switching subjects, study groups, snacking, sleeping, taking breaks, testing yourself, and the importance of organization. This article, although likely containing information you’ve all heard before, is a useful reminder of the importance of doing your best during a week of examination. To read the full article, click here. After this week concludes, we will congratulate our class of spring graduates for all the hard work and effort they have put in over the last few years. This is a very exciting time for undergraduate chapters to close and new ones to open. So, congratulations to all of you who are graduating and to all those who are still working towards their degree. Look forward to our special summer installment, or Editors’ Edition, coming soon! After school is finished for the semester, many of you will be able to read for pleasure again, not just for homework. If you haven’t yet done so, pick up a copy of UNO Writer’s Workshop faculty publication: Margaret Lukas’ debut novel, Farthest House, or Lisa Sandlin’s publication of her short story, “Phelan’s First Case” in USA Noir: Best of the Akashic Noir Series. Truly great work from extremely talented instructions. ← Special Editors’ Edition to Release Soon!